We have this week handed-over Pendle Court Day Nursery. This is a new-build, purpose-built children’s nursery, which will be occupied by Pendle Court Day Nursery. The nursery is of bespoke design and will accommodate up to 190 children, from ages three months through to pre-school age. 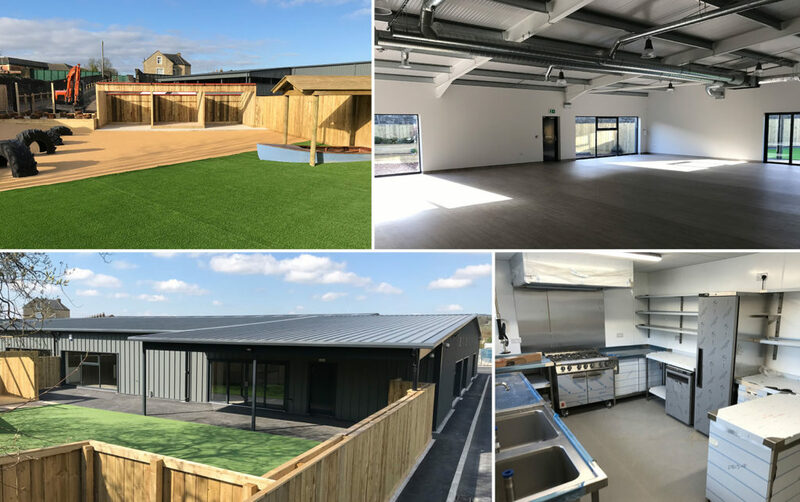 It is a 15,000 sq foot, bespoke nursery with ample outdoor play areas and car parking facilities. It is situated at Pendle Court in Nelson, just off junction 13 of the M65 motorway. We undertook the role of Employer’s Agent to project manage the works through to completion. Works commenced on site in July 2018 and were completed exactly on time, on 12th April 2019. The programme was critical as the nursery needed to be opened by the operator for the start of the term immediately following Easter. It was a Design and Build contract and our role entailed preparing the specification / employer’s requirement documents; reviewing contractors’ prices; preparing the JCT contracts prior to commencement; and liaising with the developers’ solicitors who were putting in place the Development Agreement with the buyer / end-user. We ensured that conditions of Planning approvals were dealt with, that the Building Regulations applications were submitted, and that that warranties were in place. We also made sure that CDM Regulations were being followed and that insurances were in place, as well as making arrangements for mains services connections to the site. Then. throughout the build period, we inspected the works regularly, held monthly meetings, assessed interim applications for payment and certified payments to the contractor, assisted with technical queries and made decisions in relations to variations to the contract, undertook a snagging inspection, and ultimately issued the Practical Completion Certificate. We monitored costs, programme and workmanship standards, ensuring compliance with contract drawings and specification. We liaised at all stages with the various parties, including the develop/land owner, the appointed contractor, the buyer. A bank was also lending money to the buyer and so we also liaised with the bank’s monitoring surveyor who undertook periodic inspections in relation to drawdown payments. We provided support to our developer client at every stage of the process and worked with all of the various parties to ensure a top quality building being completed on time and on budget. The developer was client (Pendle Court Developments Limited and the contractor was MSM Construction (Northern) Limited. It has been a great project to have been involved with, and a fabulous end-product. It really will be a first class nursery facility and we wish Pendle Day Nursery every success with their new operation.